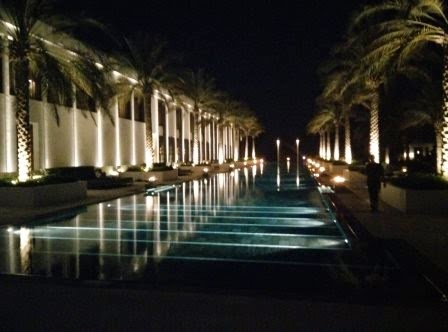 A few weeks ago Mrs Sythe & I went out for a dinner date (I'm so happy we found a good babysitter) and we decided to visit The Long Pool Cabana at The Chedi. The evenings are cooling off now so we figured some al fresco dining would be ok, and it was. We arrived at the long pool around 8pm without a reservation and chose where we wanted to sit without any hassle. The lighting was sufficient for conversation and casual dining (if I were sitting down to a full meal I think I'd like a bit more light) and there was music playing softly in the background. It's quite a setting and is certainly very laid back. 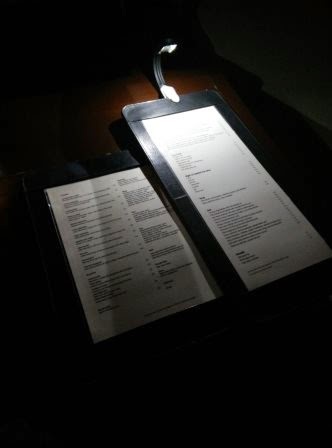 Because the lighting was muted, the menu's came with little lights on so you could see clearly, a nice touch I thought. The service was amazing, and we ordered 5 food dishes (think a sort of tapas bar but with a focus on sushi) and some cocktails. I had a few alcoholic cocktails and Mrs Sythe had 2 non-alcoholic cocktails - they were all super delicious! 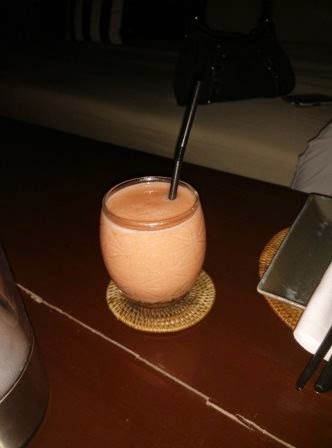 I could go back there just for the cocktails I have to say, they really were amazing! 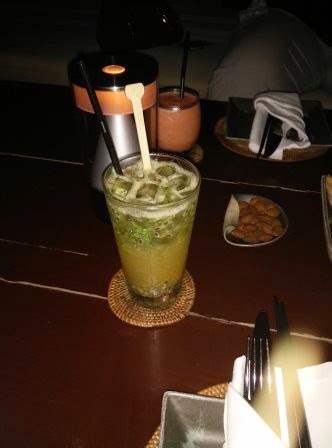 The two I had were a passion fruit mojito and a 3 melon juice one. I took pictures of them but they don't really do them justice, but I have included them here anyway. While we were waiting for our food to come, we were served up some prawn crackers and those awesome nuts they have at the Chedi... those smoky almonds or whatever they are. Delicious, is what they are. The food came very quickly and everything we ordered was amazing (tuna tataki, spicy chicken salad, chicken satay, popcorn shrimp and a Wagyu steak). My favourite was actually the waiters recommendation; the Wagyu beef - it was so tasty! The portions were small, but the focus of the venue is on relaxing and just snacking - hence the tapas reference above. I used chop sticks to pick at any of the 5 dishes we ordered and had a great night out. Now the winter months are coming and out-side dining is once again a possibility (without melting that is), places like the long pool cabana are great - especially great for a date! It's quiet & laid back, the food and drink is excellent and it won't totally break the bank either. 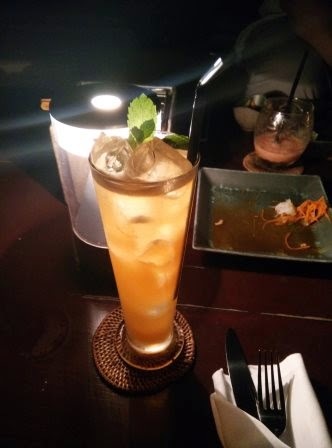 For 5 dishes, 2 alcoholic and 1 non-alcoholic cocktails the bill came to RO 56.277. Now that seems a lot, but go for a dinner for 2 at The Restaurant, or Tuscany or somewhere else of that calibre, and have a few drinks, and you won't get much change out of RO 100. The Long Pool Cabana Bar is open until 11pm, and the restaurant is open between 6 and 10:30pm.